You must make reservations at least 5 minutes in advance of the time at Lou Bird's. Parking is validated for the Parksafe garage at 2031 a half block west of the restaraunt. Westbound Bus Rte 40 at 20th st.
Had a delightful brunch - the food was great and our waitress, Chloe, was absolutely fantastic. 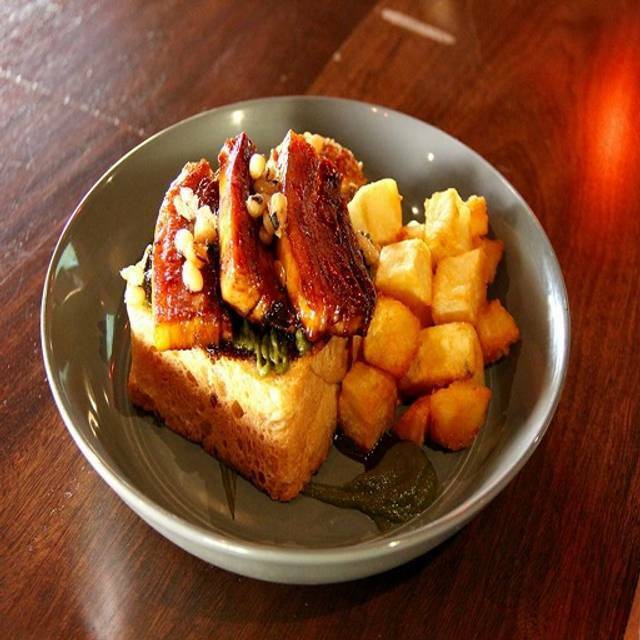 Really good food, friendly service, overall very enjoyable meal. Make sure to order the onion tart! Great group dinner - 10 guys, perfect venue. Highly recommend the chicken Marsala. Service was great as well. Great brunch spot in a nice area. Service very friendly. honored my reservation. We enjoyed the donut holes while we waited. Food was good - could have been hotter when served. Ambience good - easy to have a conversation! Lou Bird’s food was excellent. All four of us enjoyed our drinks, appetizers, and entrees. That said, they really need to work on the service. We had a 6:15 reservation prior to 8:00 theater tickets. Our server was very cordial and brought bread right away, but no bread plates. Our appetizers were brought but no plates for sharing. Silverware was taken after appetizers were finished but nothing replaced when enteees arrived. As I mentioned, the food was excellent. In order for Lou Bird’s to survive in a very competitive restaurant neighborhood, service must improve. I wish them the best. Remains one of my favorite spots in Philly. May look like a dive from the outside, great restaurant and bar inside. Super casual atmosphere, but don’t let that fool you. Food is spectacular - the halibut is a must have. My experience at Lou Birds was awful! The service was poor and the food was even worse. Steak Frittes tasted like they ran to the local Acme and slapped it together. Apps and entries were served together after an extended wait. The menu was exceedingly expensive for the bad food we were served. I actually walked out of there not just disappointed but angry! The service was fantastic, the restaurant was very comfortable and not too loud to talk and hear our own conversation. The food was delicious, however, we would have preferred the duck was trimmed a bit more before being served. Most on my dish was fat, not meat. Also, the Brussels were soft and mushy, they needed a bit of crispy. I understand that we dined during Restaurant Week and the expectation of the guest is low, but my experience at Lou Bird’s was abysmal. The food was mediocre. The service was atrocious. She rushed what was clearly written as the first and second course on the menu, serving them together. Then never returned to offer another drink because she suddenly was behind the bar making cocktails for the bar guests. When entrees arrived, we had no silverware and when we finally were able to get the attention of who I can only assume was the manager, he poked one of our guests with the steak knife without apology. After we finished entrees, which were not good across the board, we waited 30 minutes for dessert, the easiest course to prepare and get your table out the door. Underwhelmed is an understatement. Hopefully this isn’t the experience you provide to guests year round. Don’t participate in Restaurant Week if you don’t appreciate the guests it brings in. Great neighborhood find. Excellent food choices and service. Son now lives in the neighborhood and we will most definitely be going back there again. The pasta dish and chicken pot pie were excellent comfort food on a rainy night. 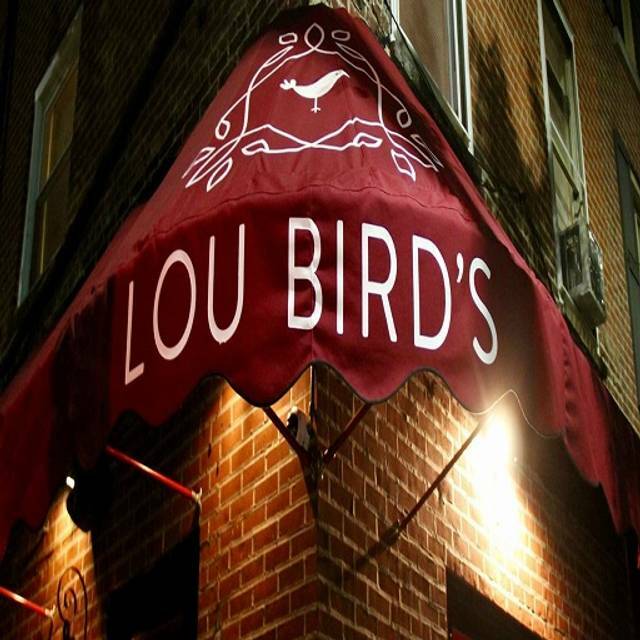 We went to Lou Bird’s for dinner with our Philly daughter. She recommended the place to us. It’s a neighborhood gem. Nice atmosphere. The food was excellent. My wife had the roast chicken (delish), I had the steak frite (excellent flavor) and my daughter the burger (also excellent). We started with cheeese board and pork bellies (also delish). Will definitely go again. Arrived very early for my reservation. Was greeted by hostess who advised no worries. I was delighted all evening with thoughtful staff, delicious food and terrific ambience. New favorite place. So happy to have visited and already made a new reservation. Hopefully, on time for this one! I was in Philadelphia for business. Came upon Lou Birds by chance. Had a great meal. Staff was very friendly. Sat and enjoyed my meal and sat afterwards sipping wine and reading a book. A very pleasant evening overall. I will be back. Very good overall experience. The restaurant has a cozy at home feel. While dining the service was great it was professional, prompt, friendly and informative. I really enjoyed the seafood chowder however it could have been made more hearty or thick. But the flavor was delicious filled and with seafood. My entree was the Lou Bird burger, cooked to order it was a juicy burger that fit in the bun perfectly however the fries were limp. I would recommend this restaurant. Our 4-top shared 3 small plates and a side before our main dishes. The first course was better than the second and arrived piping hot. The main dishes were not all hot on arrival. The table agreed the gnocchi small plate was the star. Cocktails, wine and beer were excellent. It was a rainy Saturday of Thanksgiving weekend and we were seated immediately and out faster than expected (under 90min). Service friendly but really really slow. Food good but not sure I’ll be back. Too many similar places. When you wait as long as we did for a few appetizers and the owner is sitting 2 seats away, you would expect an apology or explanation and maybe a complimentary drink. 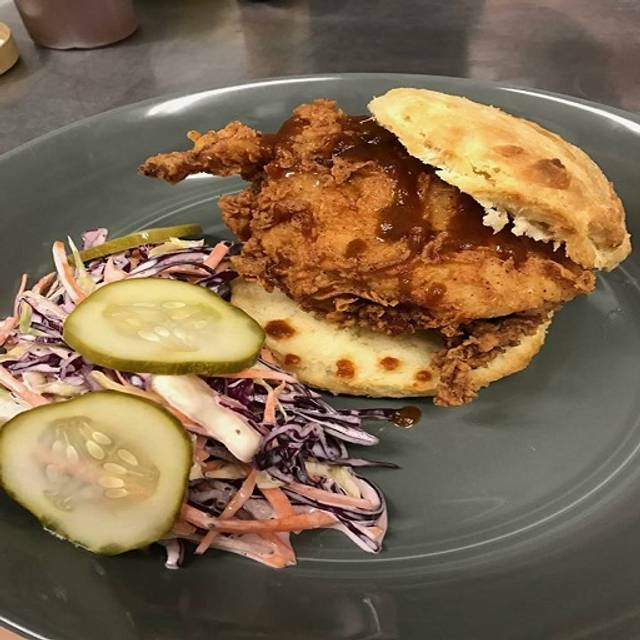 I went to Lou Bird's for brunch last Sunday and it was great. The food was delicious, the $5 mimosas really hit the spot, and the wait staff was attentive and so kind. This is very close to where I live and I'm looking forward to going back for dinner sometime. It seems like a place where you can be somewhat casual, but the atmosphere is still very nice. Great place for a date! Thanks!! After 4 days of just exploring Philly’s epic food, we weren’t impressed...at all. We ended up barely touching our food. My wife’s entree was so bland, we opted to have it replaced with something else (and we never do that). The bar area in the front seemed to be a better place to enjoy beverages. Unfortunately, it was not a place I would go again. Sadly, my only negative review on OpenTable to date. Went here for restaurant week and had a great meal in the outdoor seating area. Food was delicious and service was great! The staff was fun, kind, and engaging! 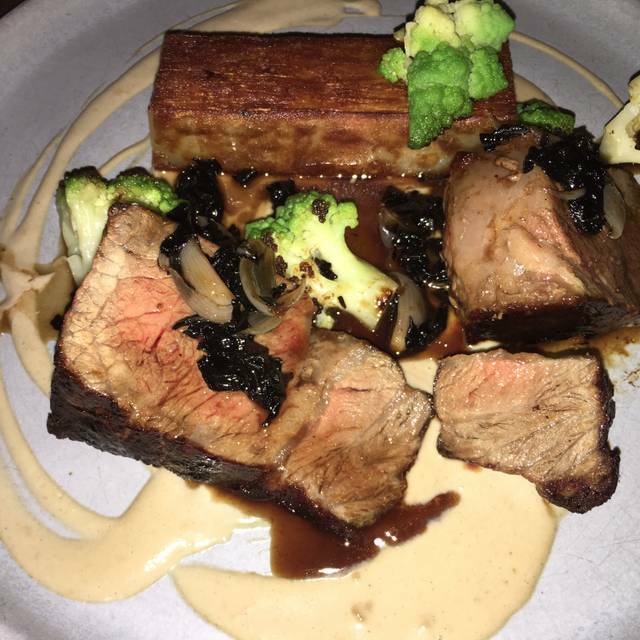 I went there for restaurant week and the owner/manager treated me like a friend. Really really loved my food as well. The Square was a bit crowded and we wanted an outside seat so we took the 3 block walk to a new spot that we had heard about but had never been. Very relaxing . Seated immediately and some specialty drinks on the table within minutes. We ended up mixing and matching the appetizers and never ordered a full dinner so no comments there. The waitress was very attentive , no issues . The interior space was actually very large . looked like a nice spot to have an event. Very cool bar area. The food was good. Had spinach and crab omelette and it had good taste but was a little watery. Side salad was undressed. Bloody Mary was great. Outdoor table was wobbly. Waitress was very competent. Great spot. Ate outside and food was very good and wine selection was really good. Fathers Day - sat outside. We had diner at Lou Bird recently. The food was good, desert not great, service was terrible. Mother's Day Brunch and no dessert available....whaat???? We had a great time at Lou Birds. For a Saturday night the restaurant was full but not overly noisy which permitted table conversation without effort. The small plate items are great; our group sampled almost all of them. Each better then the next. My personal favorite was their Burrata. Creamy deliciousness. Of the large plate items, the strip steak was good and the potatoes served quite creatively. Another person in our group has the scallops but wasn’t overly impressed by that dish. Good but nothing too unique. The menus is all good. One complaint, they were still serving their “winter” cocktails in May. We were told they were changing them the next day but they apparently couldn’t make any of them the night before while we were there?!? So we didn’t get to enjoy that portion of the menu because no one wanted a “figgy pudding” (Christmas) spiced cocktails in May. Overall a good meal and worth a visit. Found this place randomly on Open Table and wasn't disappointed. The food was by far one of the best I've had in the city. I heard they are really known for their brunch items, but their dinner items were simply amazing. Check this place out! You won't be disappointed! Lou Bird's is an excellent restaurant. 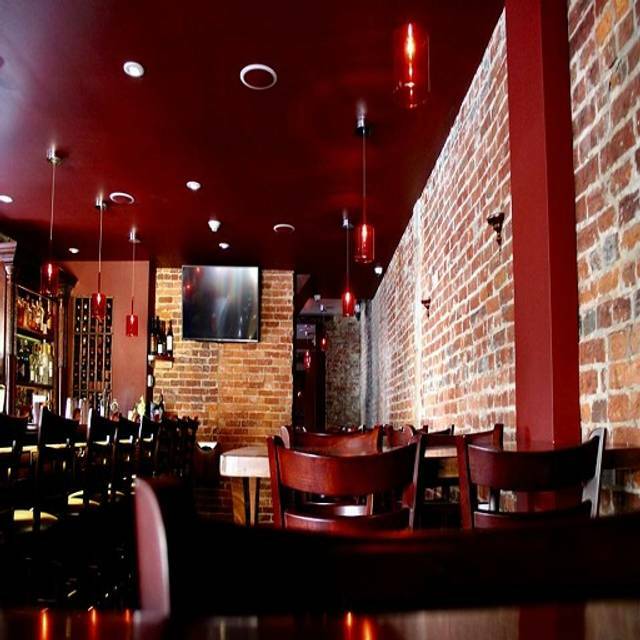 The food and atmosphere are outstanding and the staff is very pleasant and helpful. We have especially enjoyed brunch there with our grandchildren. However, in the evening, the food and environment continues to be extremely good. Went for weekend brunch. All around it was average.